Back in December, I decided to do the new 60 day home workout program from Beachbody called Hammer and Chisel. This program is intense and includes a variety of different workouts, including cardio, weights, power lifting, agility and plyometric training. Following this program means working out six days a week for 30-40 mins at a time, and eating according to a portion controlled clean eating nutrition plan with the goal of chiseling out an amazing physique! I was pumped and ready to start on December 14th. I weighed myself to establish a baseline, but I never took before pics or measurements. Big no no! I always tell my clients that they need to establish their baseline before starting a new program so that they can see how far they have come. I sadly did not listen to my own advice. Then winter break came…I kept working out at the gym at Deerhurst as we were up north for two weeks, but my nutrition went out the window. Let’s just say there was some pizza, some Dairy Queen and a bunch of muffins and chocolate. And then to top it off, I got sick for a few days and missed some workouts. I just wanted to be honest with all of you – even though I am a coach, I am also human and sometimes I veer off track…very far off track. However, I have seen some fellow coaches acheive awesome results on this program so there was no way I was giving up on it. The only way to fail is to quit, and I was not going to quit! I was determined that this time I would give my workouts my all. I would push myself. I would lift heavy weights and challenge myself. I would stick to my meal plan 100%. I’m so proud to say that week 1 was a huge success! For me – doing the workouts is a no brainer. Working out 5-7 days a week for 30-45 mins is just part of my routine. I don’t always want to work out before I start, but I crave the feeling that I get when I am done. I am addicted to the endorphins and how amazing I feel after my workouts. I love that I don’t have to go to a gym and be around other sweaty germy people. I love that I don’t need to leave my house on cold mornings. I just love my home workouts! The part that is more of a struggle for me is following the meal plan. Anyways…I digress. My point here is that I have struggled in the past with nutrition and I believe that was the one thing holding me back from seeing defined muscles throughout my body, and in particular in my abdominals. So…..I decided I would go all in with the meal plan for one week and see what happens. If I survived week one, I would give it a try for week two and so on and so forth, until I completed 8 weeks. I find it hard to commit to 8 weeks upfront, that’s why I decided to take it one week at a time. How did I fare with the nutrition plan? It was challenging at times, but I pushed through. Often we are tempted to take the easy way out, to not challenge ourselves or go beyond our comfort zone. I pushed myself way out of my comfort zone with the nutrition plan. I measured out and planned out every meal. We went out for dinner a few times and I stayed far away from desserts and bread and ordered a salad with protein (chicken or fish) and salad dressing on the side. I ate at least 4 servings of veggies and protein a day. I had ZERO sugary treats. For me, I do better when I have NONE rather than SOME dessert. When I have one cookie I want more and more and more. When I have none, I am OK. I learned this week that carrots are delicious and so is jicima. Your taste buds really start to change when you cut out processed food, and real food tastes AMAZING! I still ate carbs, but in the right portion and the right kind – ie sprouted grains, steel cut oats, quinoa and sweet potatoes. I was not hungry but I was definitely not stuffed. Sometimes right after I finished a meal, I felt like I could have eaten more, but then 30 mins later that feeling had passed. I have energy to power through my workouts, so to me that signals that I am eating the right amount. I have substitued my after dinner snacks with some tea and lighting a scented candle. 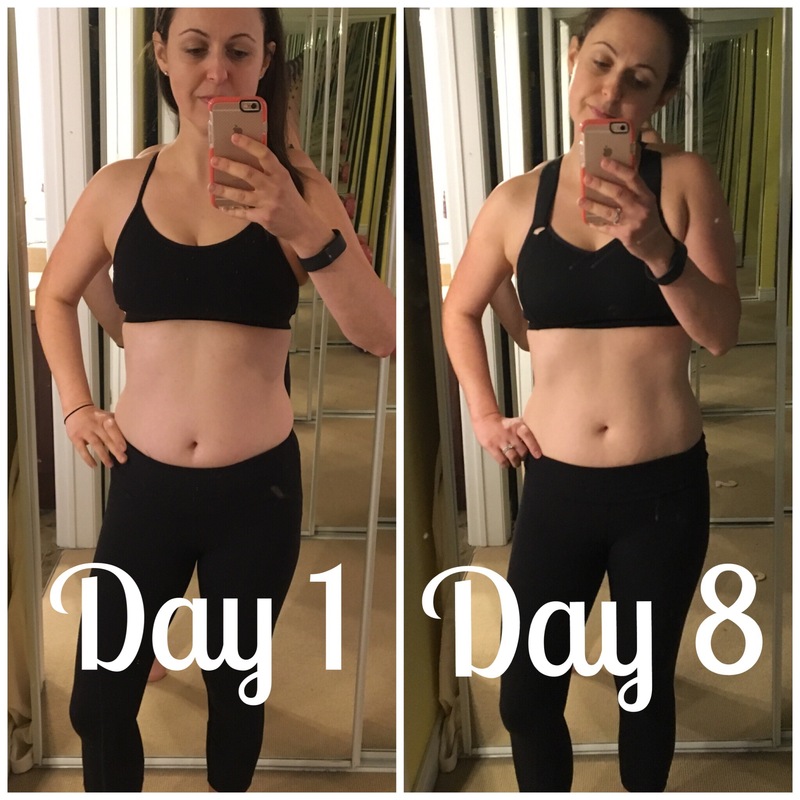 I’m creating a new habit that is healthier…and it seems to be working! So what happened in 8 days? I lost almost 5 lbs! I went from 132.8 to 127 pounds. Since having Alex I see the 120s every once in a while…but it hasn’t been consistent. I feel good in the 120s and my clothes are fitting better. I want to stay in the 120s! I don’t expect or want to lose 5 lbs every 8 days on this program. I know that the first week was getting rid of all the holiday fluff I had accumulated over the winter break as a result of carb overload. I’m curious to see what will happen as I keep going. However, I am making a promise to myself not to be obsessed with the scale – it is just one tool to use to track my progress. I’m happy that there is a visible change in my picture! My goal was to chisel out my abs and it seems like it is working, and it’s just been 8 days. 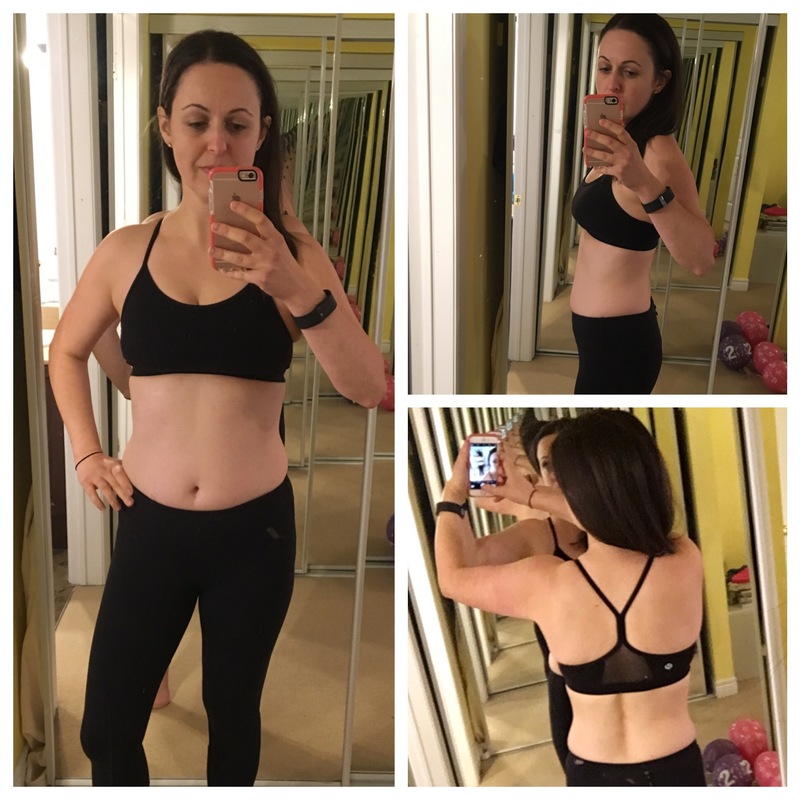 I’m thrilled with my results, and the visible change is pushing me forward to be strong and keep going! I’m putting together my next 21 day health and fitness challenge. We start February 1st. If you have been wanting to start taking better care of yourself – this is the perfect opportunity! Join my supportive community of women who help each other on their journies towards better health. Be a part of our group – work out everyday for 30 mins from the comfort of your home, learn about portion controlled clean eating and enrich your mind, body and spirit! If you want more info, please shoot me an email at sheryl@ikor.com or PM me via Facebook and I will get back to you ASAP with the details about the challenge. Categories: 21 Day Fix, Discipline, Exercise, Hammer and Chisel, Meal plan | Tags: 21DayFix, Exercise, home workout, Meal plan, weight loss | Permalink.